accelQ delivers automation to the entire Quality value chain to accelerate time-to-market and facilitate building better quality software. accelQ’s Quality Driven Development (QDD) implements an innovative Agile Quality Life Cycle approach, integrating the usual test silos into an end-to-end automated process. 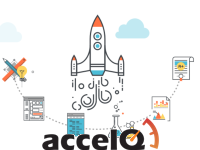 accelQ is built on a cognitive core engine bringing the power of predictive analytics in scenario design, autonomics in test automation and adaptive change management in traceability, just to name a few.